A geek who sits around wondering whether cooking with fresh pumpkin is really worth the effort. A geek who wasn’t very good at science, but can fake her way through an experiment by using fancy words like hypothesis. A geek who has spent the better part of this week roasting fresh pumpkins, microwaving fresh pumpkins and then cooking the exact same recipe with fresh pumpkin puree AND canned puree. I hope I haven’t bored you with my geekdom. They were noticeably different in color and texture. 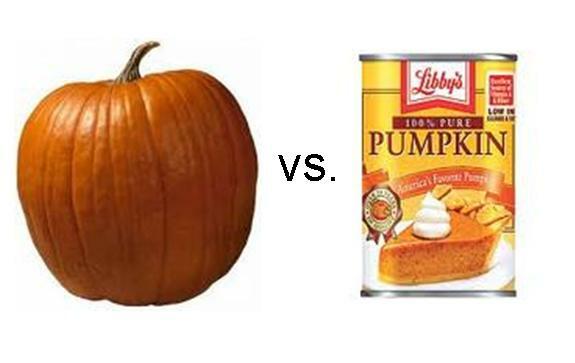 The canned pumpkin was darker and thicker, which didn’t bode well for Mr. Fresh. I sampled the raw purees about 30 times (seriously…with palate cleansers in between. GEEK.) and thought the canned tasted stronger and sweeter and the fresh had a very pure squash taste, with fewer sweet undertones. I wanted to make a dessert where the pumpkin was center stage and not baked into a cookie or something, so that I could really compare the taste. I turned to my favorite retro dessert, Pumpkin Spice Bars, which appears in the 1981 edition of my church cookbook, but date back to the early 70s. Like most 70s recipes, they use cake mix to make things easier. Groovy. Here’s a picture of the bars after they cooled (fresh on the right this time, canned on the left). The fresh is definitely lighter in color, though the texture of both bars is similar. The fresh did take 7 minutes longer to bake though. And the taste? I hate to break it to you but I like the canned pumpkin bars better. Their flavor was just more there. However, the fresh was lovely too…it almost had a floral note to it that would be amazing in a more delicate dessert (like a souffle). The difference between the two bars was very subtle; if I hadn’t tasted them side by side I might not know the difference. So there you have it…I may have wasted an entire week of my life but you don’t have to. Canned pumpkin makes delicious desserts! For the filling, mix all ingredients by hand and spread evenly over crust mixture in pan. For the topping, mix ingredients by hand until crumbly. Sprinkle over pumpkin mixture. Bake at 350 for 45-50 minutes or until center does not jiggle. Cool and refrigerate. Serve with Cool Whip (how retro!). I’m just now finding this and was wondering, as it looks like the pumpkin you roasted was quite large, if your fresh pumpkin was specifically a pie pumpkin. Regular, larger pumpkins are supposedly less sweet and are less “pumpkiny” than the smaller pie pumpkin variety, or so I’ve read. It was a pie pumpkin. I think the close-ups make it look bigger than it really was!